(At front middle) Beatriz Garcia of Edgewater receives a special volunteer recognition award for her 18,500 hours of volunteer service over the course of more than 20 years at Palisades Medical Center. Pictured with Ms. Garcia are (left to right) Aaron A. Stein, MD, chief medical officer; Patricia Carroll, FACHE, chief operating officer; Joseph G. Burt, vice president / executive director of the Hackensack Meridian Health Palisades Medical Center Foundation; Denise Whitley, coordinator of Volunteer Services; and Heather Veltre, MS, BSN, RN, NEA-BC, chief nursing officer. 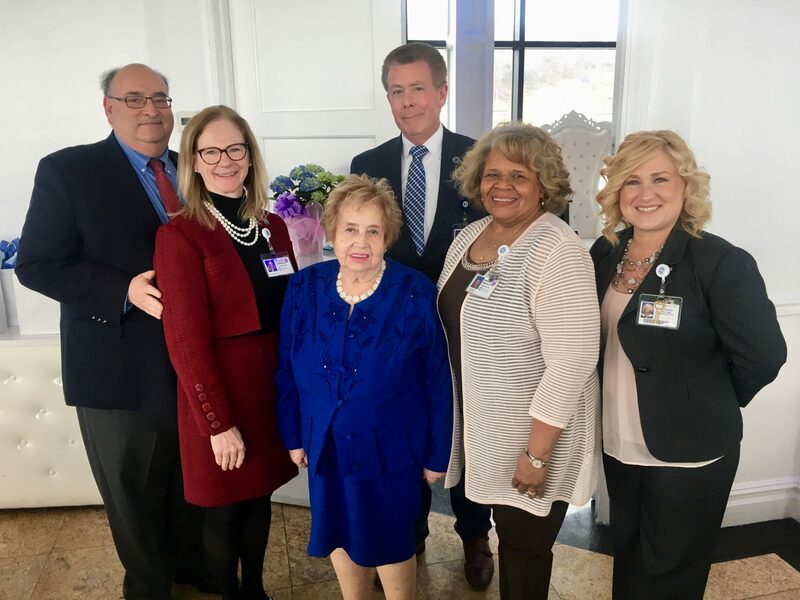 Hackensack Meridian Health Palisades Medical Center celebrated National Volunteer Week by holding a special luncheon at The Waterside in North Bergen to recognize its volunteers for their efforts. More than 200 volunteers offer their time and energy in almost every department of Palisades Medical Center, including student volunteers from Academies at Englewood, Bergen County Special Services School District, Cliffside Park High School, Leonia High School, Weehawken High School and Union City High School. Volunteer activities at Palisades Medical Center include assisting the nursing staff and patients, working in the Gift Shop, performing clerical duties, and organizing special fundraising events. For more information or to volunteer, please call Denise Whitley, coordinator of Volunteer Services, at 201-854-5011.